Combine racing and exploring in one tour with the Dragon's Fury and mystical cycle adventure in Bhutan. 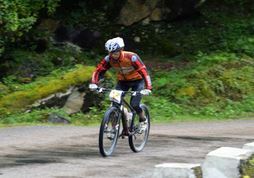 (TRAVPR.COM) THAILAND - March 31st, 2015 - SpiceRoads Cycle Tours is offering an epic package which combines a 60km mountain bike race – Dragon's Fury – with a 14-day SpiceRoads Mystical Bhutan cycle tour. This adventure is perfect for anyone that is keen to explore this highly religious country and at the same time compete against the local Bhutanese in a unique mountain bike event. A unparalleled experience where riders will push themselves to the limit for 60km on tarmac, climbing 1,740 meters through the mountains of the Kingdom of Bhutan. Although this is a race, anyone can join, and it will be an experience to race in the same area as the Tour of the Dragon – a 258 km race billed as one of the toughest one-day mountain bike race in the world. The Dragon's Fury Race starts in Messina and heads 38kms to Dochula at 3150 m. This section is all up hill with an average slope of 5% with a few short sections of up to 10%. Once the race reaches Dochula, it is downhill to Thimphu at 2330m with a small climb. A challenging 14-day Himalayan adventure cycling 560 kilometres in 8 full days of riding at an altitude of 3,400 metres. The outstanding scenery, abundant wildlife and flora, a deeply religious and benevolent people makes for a truly wonderful bike trip that will live in your memory forever. The cost for the 3-day Dragon's Fury Race package is US$795 with an additional US$40 for bike rental. This includes registration, visa, airport pick up, two nights accommodation, some meals and transfer. Registration for the race needs to be before August 7.